Whether the replication be honest or ironic, several Eiffel Tower-inspired structures exist outside of Paris, France. Is it the true Eiffel Tower, or just an imposter? Gustave Eiffel’s company designed and constructed the original Eiffel Tower between January 1887 and March 1889 as part of the 1889 World Fair to celebrate the 100 years of the French Revolution. Gustave Eiffel quotes the New York Latting Observatory as his major inspiration for the design of the tower. The observation and broadcasting tower, built of wrought iron, was the tallest human-made structure in the world until 1930 at the height of 1063 ft at the tip. 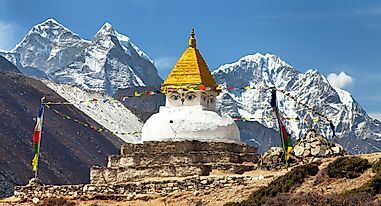 The tower has a square base of 410 ft, three floors, and 8 lifts and elevators. 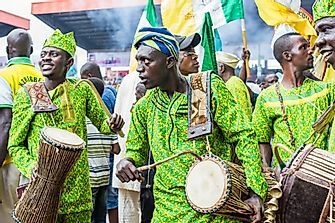 Despite criticisms from earlier French artists and academics, the Eiffel Tower is an architectural inspiration with numerous other countries from all over the world erecting their replicas of the Eiffel Tower. The then Minister for Culture in France, Andre Malraux declared the tower as a historical monument in 1946. The Eiffel Tower is a famous tourist attraction and is currently one of the most visited monuments in the world. The Eiffel Tower of Paris, Texas sports a cowboy hat. The Texas Eiffel tower in the US is a 65-ft replica of the original Eiffel Tower. A group of local welding union members constructed the Texas Eiffel Tower in 1993 as a dedication to the original Eiffel Tower in Paris, France. A shinny-red cowboy hat was added at the top of the tower in 1998, which makes it one of the unique replicas in America. The Texas Eiffel Tower and the Tennessee Tower were erected in the same year and were in constant battles for being the tallest replicas of the original. 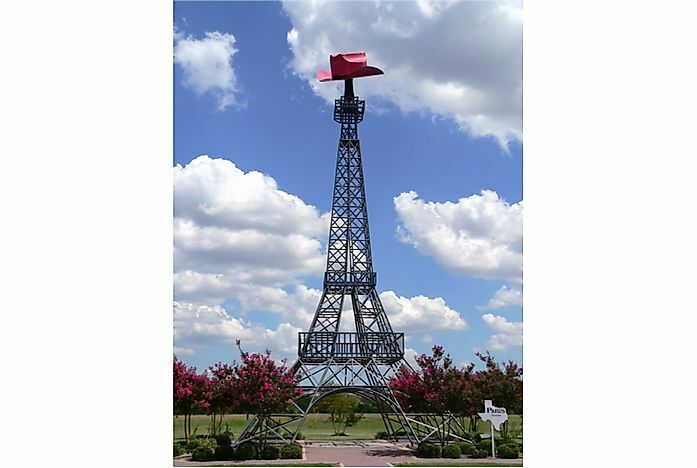 The Paris Texas Eiffel Tower currently stands as one of the most important landmarks and tourist attractions in Texas. The cowboy hat at the top adds a unique touch to the tower. The Copenhagen Zoo Tower, inspired by the Eiffel Tower. 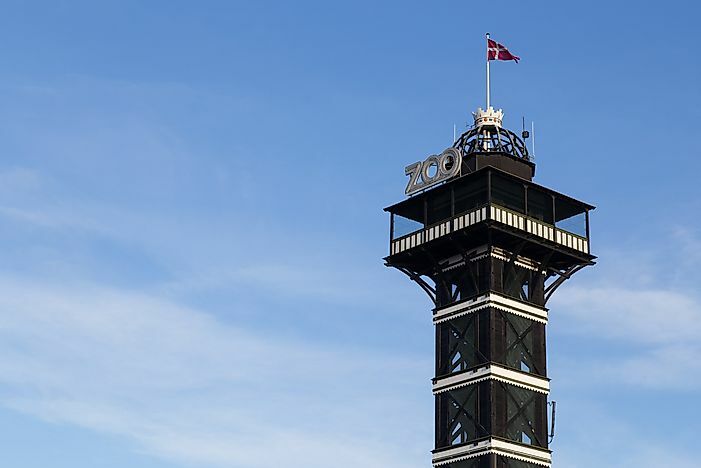 The most notable feature upon entering the Copenhagen Zoo is the Copenhagen Zoo tower. The Copenhagen Zoo Tower is a wooden structure with a square base resembling the Eiffel Tower. Otto Arboe built the tower in 1905 on the Valby Hill. The observation tower, located within Denmark’s Copenhagen Zoo, stands at 142.7ft and is the tallest wooden tower in the world and one of the most prominent towers and tourist attractions in Denmark. From the observation deck of the tower, tourists can enjoy an unobstructed view of the surrounding Copenhagen city as well as areas within the zoo. The observation deck is accessible by climbing a series of stairs. The Eiffel Tower in Shenzhen, China. Upon entering the Window of the World theme park, the spectacular view of the Eiffel Tower greets the visitors. 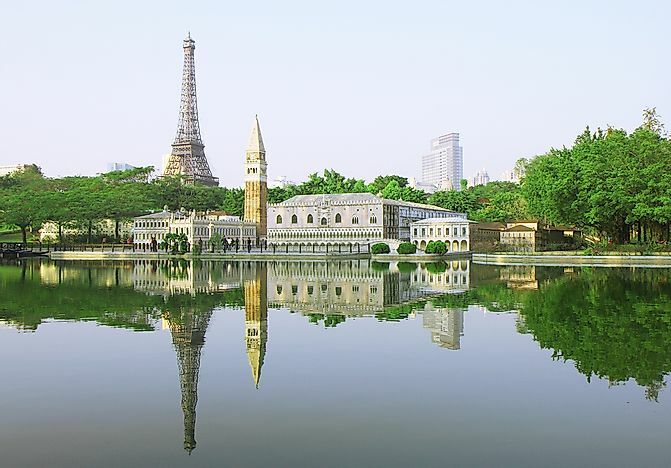 The Eiffel Tower of Window of the World is a Chinese replica of the Eiffel Tower located in the city of Shenzhen. The tower, opened in 1993, is one of the major tourist attractions of the Window of the World, a theme park offering some replicas of world buildings and top attraction sites. 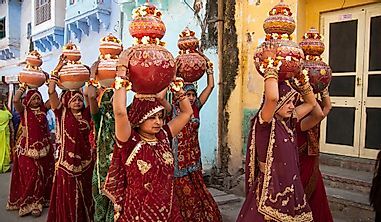 The Eiffel Tower is one of the replicas of famous world tourist attractions standing close to the pyramids and the Taj Mahal. 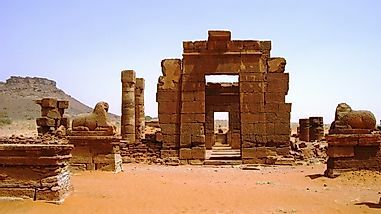 The tower closely resembles the original at Paris except for the height. The 354ft tall tower dominates the skyline of the theme park providing a unique view to the surrounding areas. The Eiffel Tower at the Parisian, Macau. The parisan Macau is an integrated luxury hotel in Cotai, Macau. The hotel features one of the most important landmarks in China –the replica of the Eiffel Tower. The half-scale Parisian Eiffel Tower at Macau is one of the modern replicas of the Eiffel Tower. The model imitates the design and construction of the original but incorporates modern features such as the use of steel instead of wrought iron. 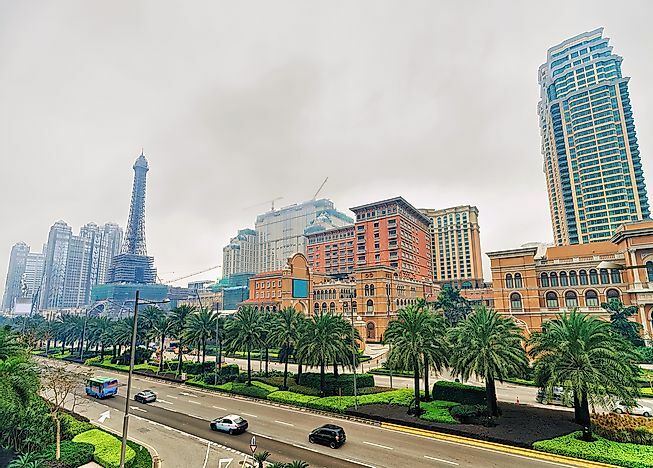 Due to its location in an environmentally sensitive area, the Eiffel Tower replica is built to withstand typhoon winds that are common in Macau. The tower, opened in September 2016, is one of the major tourist attractions in Macau. Additional ornamental features on the tower include gusset plates, lights, lattices, staircases, mesh screens, cornice scrolls, and balustrades. The tower includes observation decks from which tourists can enjoy the surrounding view of the Cotai Strip. Las Vegas's interpretation of the Eiffel Tower. Like most of the American cities named after Paris, Las Vegas has its replica of the Eiffel Tower. The construction of the tower ended the existing disputes between the Eiffel Towers in Tennessee and Texas over which was the tallest replica. 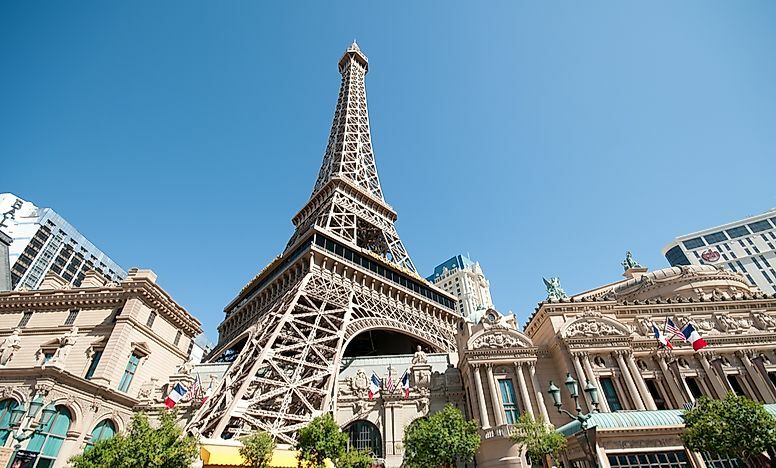 The Paris Las Vegas Eiffel Tower is a 540-ft replica located on the Las Vegas strip. The nearness of the tower to the airport restricted the extension of the tower’s height to match the parent Eiffel Tower. The Eiffel Tower opened in 1999, is one of the most famous replicas located within a themed resort and is surrounded by replicas of the Montgolfier Balloon, the Arc de Triomphe, and the Fontaine des Mers. 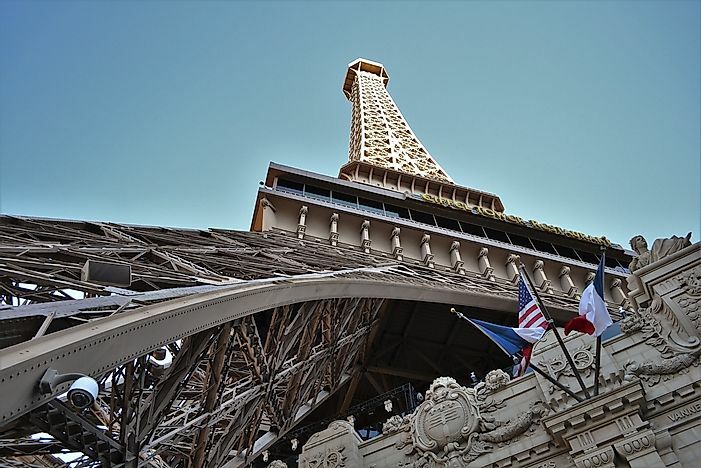 The Las Vegas Eiffel Tower is a major tourist attraction within the Parisian themed hotel and casino. The Tokyo Tower was inspired by the Eiffel Tower. 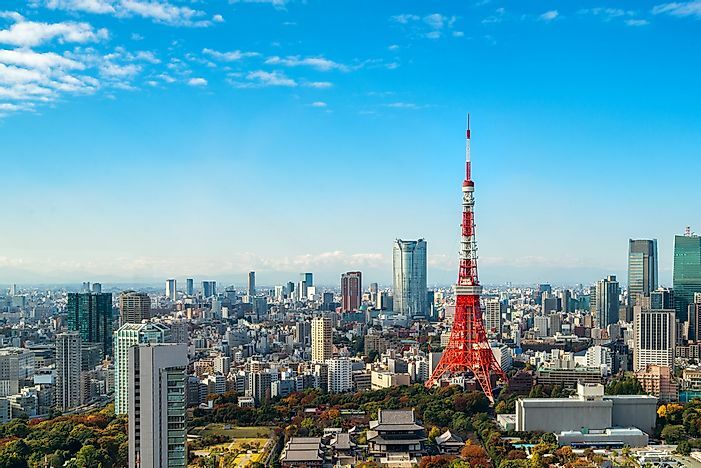 At 1,094 ft, the Tokyo Tower in Minato is the second tallest structure in Japan. The construction of the observation and communications tower began in 1957 and ended in 1958. The tower is painted orange and white and is repainted every five years. The Tower is a major tourist attraction and a communications tower leasing antenna to broadcasting stations in Japan. The tower receives about three million annual visitors who are instrumental in creating revenue for the owners – Nihon Denpato. Tokyo tower has more than sixteen floors served by four lifts. Among the floors are two observation decks, a major one at 490ft and a smaller one at 819ft. at the foot of the tower is the four-story FootTown building with a reception hall, the Aquarium Gallery and three elevators that lead to the main observatory on the tower.